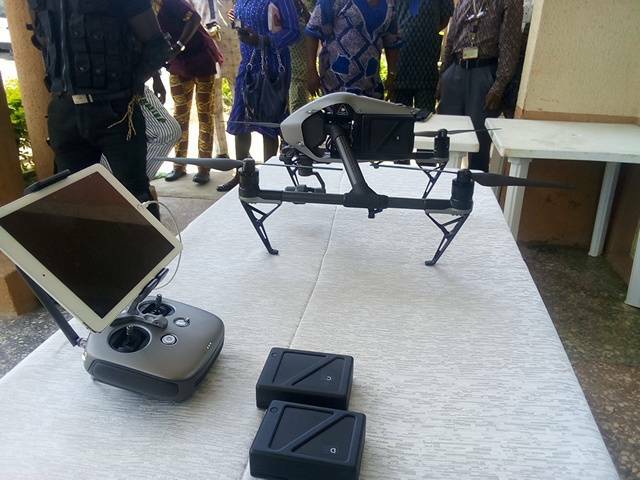 In its attempt at enhancing internal security and promoting excellence in research activities, the authorities of Adeyemi College of Education ( ACE) Ondo, has acquired a high-tech multipurpose drone in the institution. The device which came under a brand name “*Inspire 2*” and whose acquisition was facilitated through a partnership agreement entered by the College with Prof. Victor Mbarika, Founding Executive Director, International Centre For Information and Technology Development (ICITD), Southern University, Baton Rouge, Louisiana, USA, following the Memorandum of Understanding ( MoU), signed between the College and the Southern University, USA in November, 2017. is described as state- of- art equipment loaded with latest GPS technology, obstacles avoidance and fitted with several sensors as well as 4K cameras capable of reaching up to 108 km/ h and rise to a maximum height of 5,000 meters when in operations. Speaking at the ceremony where the drone’s ability was demonstrated, the Provost of the College, Prof.Olukoya Joseph Ogen expressed joy at the development saying the acquisition of the machine was aimed at demonstrating the seriousness his administration has towards ensuring safety of lives and property of staff and students in the institution. He emphasized the need for responsible leadership saying “leadership position is about innovation and exercising high level of responsibility, adding that the various achievements recorded since his assumption of duty as heads of the institution has led the College to attain leadership position among its peers in various areas. His words: “Leadership is about innovation. You will recall that since I came on board, we have been moving from one innovation to another. We have pioneered so many things in Nigeria, we are the first now to adopt this technology to fight criminality, we are the first to start e-voting and, e-procurement. We have been the first in everything, so it is about innovation and we want to continue doing that.” Prof. Ogen used the opportunity to thank the facilitator of the drone acquisition, Prof. Victor Mbarika for partnering with the College and donating 25 Apple brand Computers worth several millions naira for the use of staff and students of the institution. The College Administrator underscored the importance of Information Communication Technology in contemporary world saying its application remains the only way through which societal growth and development could be enhanced. While assuring effective and judicious use of the drone, Prof. Ogen said the device, a high-tech machine, would be properly handled by trained personnel, who would ensure its functionality at all times. He said: “The drone is a high-tech machine fitted with computers. Its operation will be monitored from the control room such that if there is going to be any problem, you will know right from there. And then, we have accessories and parts, all you need to do is to see that the person that is handling it is properly trained. The machine has very sensitive sensors such that if anything happens, like say the battery is running down, it will show some sign, in fact when it is exactly ten minutes left for the battery to shut down, it will come back to the ground on its own On the possibility of using the drone for other activities besides security, the College helmsman said it possible for it to be used for almost everything including research activities. According to him, the drone will be used for research, we can mount it on our own research farm to monitor the behaviors of insects and any other things. It is a multipurpose device, we are not using it entirely for security. It is simply because of the security situation in Nigeria that we decided to use it for security. “As it is now, it is like a mobile CCTV because there are two powerful cameras attached to it so that when it goes up, you can send it anywhere once it is under GPS,” he remarked. Earlier in his speech, the facilitator of the drone acquisition, Prof Victor Mbarika, who is also the President, Board of Trustees, ICITD, Southern University, Baton- Rogue, USA, expressed happiness and commended Management of the institution under the leadership of Prof. Olukoya Ogen for acquiring the machine in the institution. Prof. Mbarika who described the College Provost as visionary and good leader expressed optimism that the device would assist the institution in tackling internal security and other activities that would promote effective learning. He reiterated his determination to continue to support the College Management in their efforts at moving the institution to higher heights and gave assurance that the acquisition of the machine would mark the beginning of great things that would happen in the institution. The ICITD Southern University BOT Chair also pledged the readiness of his institution to support education advancement not only in Nigeria but other tertiary institutions in Africa subregion. 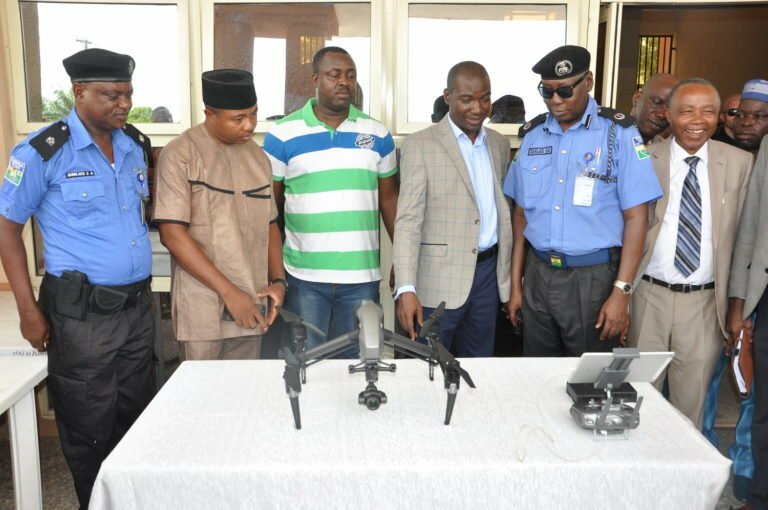 The highlight of the ceremony was the practical demonstrations of the drone’s capacity by an Information Communication Technology (ICT) expert, Engineer Ojajuni amidst thunderous applause from large crowd of people who came to witness the event Eminent personalities present at the occasion include the Area Commander Nigeria Police, Ondo South Command, Assistant Commissioner of Police (ACP) Danladi Isa, former Provost, Federal College of Education ( FCE) EHAMOFU, Prof. Banjamin Uba, Divisional Police Officer from Funbi Fagun Police Division, Ondo, representatives from Several print and electronic media, security operatives, students and staff from various Departments and Units including the Information and Public Relations Unit, College Security Unit, Adeyemi College of Education Television ( ACE TV) among others.